Video poker is a player-friendly casino game which comes with simple rules, easy-to-follow strategy guides and very high theoretical returns. However, some folks wonder whether its 100% electronic gambling format qualifies as a card game at all. Here’s what we think. Is online video poker a true card game? There are two ways you could approach this question. Some would argue in the negative, because VP is an entirely digital genre rather than a computerised adaptation of a live poker game. It has never been played with real cards, and thus is not an actual card game. We at AustralianCardGames.com.au think otherwise. Look at the core components of video poker: a full French deck of 52 standard playing cards (sometimes with Jokers added), traditional poker hand rankings, and the ability to draw and discard. It has all the key elements of real-time card play and requires a dedicated strategy, much like any of the best table games at online casino sites. Internet video poker titles also use the same kind of RNGs (random number generators) that power all your favourite real cash casino games on the Web. So if you consider video blackjack or online baccarat to be genuine card games, electronic poker should count as well. At first glance, a video poker machine looks much like your standard Australian pokies game. But there is one very big difference between the two: one requires skill, while the other is all about pure chance. Most VP games are based on five card draw – the simplest form of real money poker around. You get five cards from a standard deck of 52, and you have one chance to discard any of those for new ones. Instead of competing against other players, however, the aim is to draw one of the hands listed on the game’s paychart. 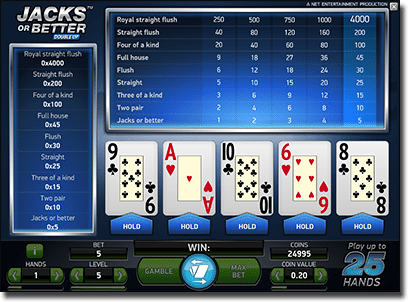 The vast majority of online video poker games use a variation of the Jacks or Better pay scale, where the lowest winning hand is a pair of Jacks or higher. Some bonus poker variants require at least a two pair or a three of a kind, to compensate for higher payouts on better hands. Start by selecting your bet size. We recommend always playing five coins per hand, as it usually unlocks a bonus on the royal flush. Hit the ‘Deal’ button to get your first five cards. Click/tap the cards you wish to keep, then hit ‘Deal’ or ‘Draw’ again to replace the rest. If your hand matches one of those on the pay chart, you win. Payouts are listed as coin amounts – so if a full house pays 45 and you are betting with $0.50 coins, your return is $22.50. Many Australian video poker machines come with a gamble feature, which gives you the option to stake your winnings on a double-or-nothing bonus game. This is usually a ‘red vs. black’ or ‘which suit?’ proposition, much like the gamble option on real money pokies. Whether or not you consider video poker to be a real Australian card game, it is certainly better value than most of your favourite table games at land-based casinos and online gaming sites. For starters, let’s look at games like three card poker and casino hold’em. These share much in common with video poker, from the payout charts to the single round of action between the initial deal and the showdown. However, they also require you to beat the dealer’s hand, whereas VP focuses solely on the player’s cards. Then there’s the house edge. Video poker is renowned for offering higher expected returns than just about any game on the casino floor, with some versions even paying above 100% when comps and benefits are factored in. For example, the house edge in online Jacks or Better (0.46%) compares very favourably to standard casino hold’em (2.16%), 3 card poker (2.32%) and Caribbean stud poker (5.22%). When playing online, many video poker releases offer even better odds than real money blackjack. Keep an eye out for All Aces Poker at top Microgaming casinos like Royal Vegas Casino, as it favours the house by a measly 0.08% – even less than the single-deck Classic Blackjack Gold Series game, at 0.13%. Microgaming is the leading developer of online gaming software for international casino websites. As such, it is one of the most prominent providers of Web-based video poker for real money play, with a game catalogue that covers all the most popular (and some of the more obscure) variants of Jacks or Better poker. Many of the titles listed below are available via desktop download for Windows PC, instant play for Mac OS X, and mobile gaming on all iOS and Android devices. Those marked with an asterisk (*) are also part of the Power Poker series – Microgaming’s premier multi-hand video poker collection. * Read our extensive guide to video poker variants. This part of the guide is intended for our international readership only. Australians cannot gamble online after September 2017 due to the Interactive Gambling Amendment Bill 2016 coming into full effect, prohibiting offshore and local online casinos from servicing Australians. To play the aforementioned video poker variations and more online for real money (safely and securely), we only recommend the most reputable and trusted Internet casinos on our site. – Learn proper video poker strategy. Each title comes with a list of set plays which, when followed to a tee, give you the best possible chance of coming out with profit in the long run. These charts are easy to follow and can even be kept on hand for instant reference when you play video poker online. – Always bet five coins per hand. Most games offer a big jackpot on the royal flush when you bet the maximum, which takes a big bite out of the house edge. Even you play the smallest coin size, always stake five of them. – Don’t be afraid to use the gamble feature. In most cases, this optional bet carries no house edge whatsoever – you either double your winnings, or you lose them. The gamble is a great way to turn small wins into very big ones. – Bonus poker games aren’t always better value. Yes, titles like Double Double Bonus Poker offer huge rewards if you should hit a four of a kind, but they also shorten the odds on more likely outcomes such as full houses and flushes. Know the numbers and how they affect your chances of long-term success. – Gamble responsibly. Like all casino games, video poker is supposed to be a bit of fun. Never play with cash you can’t afford to part with.